As technology advances, each social media tends to upgrade their service as well. 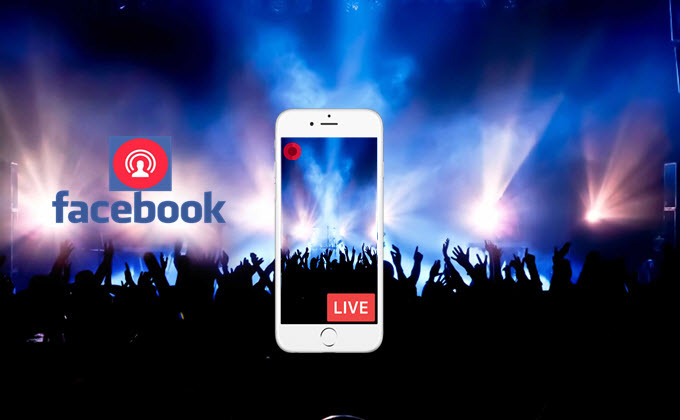 For example, Facebook released an added feature in April 2016 as it incorporates video live streaming function for both Android and iOS platforms and attempts to compete with other live streaming apps. Now you can view various live video streams on Facebook 24/7 for free. But in spite of these, downloading videos is not supported, so to save a certain live broadcast, all you need to do is to record Facebook Live stream. Recording computer screen can be done easily, but how about recording your mobile screen? To figure things out, some of the finest applications that you can use in recording live Facebook stream are provided after the jump. 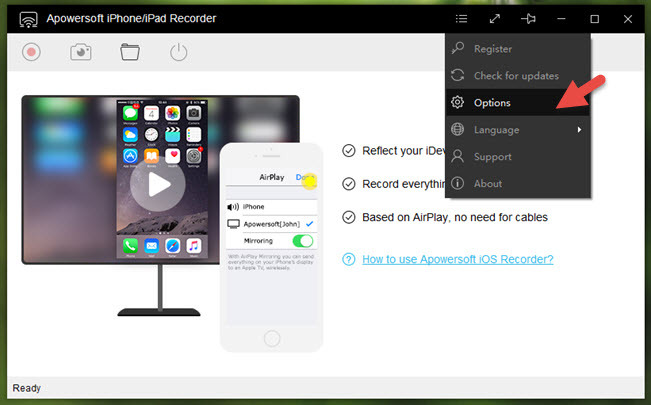 If it happens that you are sporting an iOS running device such as iPhone or iPad, then the best way for you to record Live on Facebook is by using Apowersoft iPhone/iPad Recorder. This program does not need any jailbreaks for it to work, all you need is to enable the built-in AirPlay function from your iOS device and you are ready to go, no extra software, no safety risk. By using this tool, users can mirror their device screen at the same time having the screen recording function, which they can start anytime they want. Here’s how to record live on Facebook using this program. Make sure your computer and iDevice are set in the same network. Get and install the software by hitting the download button below. Once installed, go to settings and make some configurations like display quality, video format and quality, output folder, etc. Next, connect you iOS device to the program by enabling the AirPlay function. Just choose the one showing the name of your PC and enable it. When your screen is mirrored successfully, open the Facebook live stream that you wish to capture and then tap it to enlarge. To record, simply click the record button located at the upper left portion of the tool. And to end the recording, click the stop button and the containing folder will pop-up along with the recorded file. Moreover, if you need to take a snapshot of your Facebook live broadcast instead of a recording, then you can easily do it by hitting the screen capture function represented by a tiny camera. And for those who also desire to record Facebook video chat on their devices, Apowersoft iPhone/iPad Recorder is also a great option. In case you want to record Facebook Live stream directly on you iOS device, then you can give this tool a try. This is a third party screen recorder that can’t be found in AppStore or iTunes. To get this app you must download it directly from Emu4iOS page. 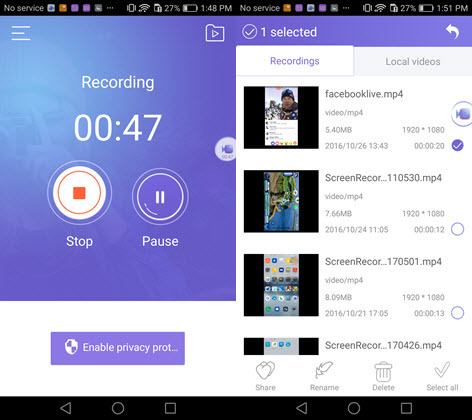 Like other screen recorder, this app is designed to work without any jailbreaks. It has a simple interface that allows users to start and stop recording with only a few taps. However, some users have concerns in using this app that include black screen while recording some games and a fixed recording bar that is visible in each recording. To use this screen recorder, download and install it from emu4ios.net. After that, look for the live stream video from Facebook that you need to record. 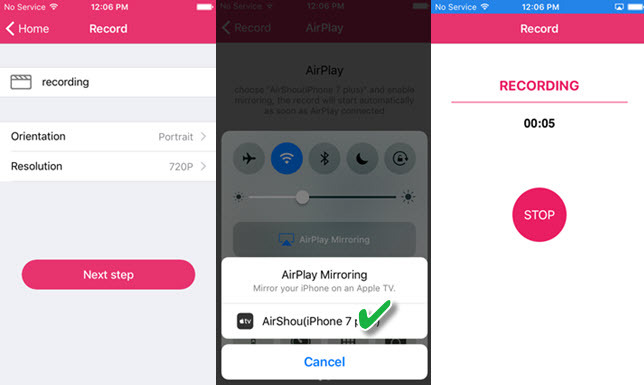 Now launch back AirShou, press the record button to start the recording, slide up your phone screen to enable the AirPlay and connect it. To finish it, just tap the stop button and the recorded file will be included under its recording list. 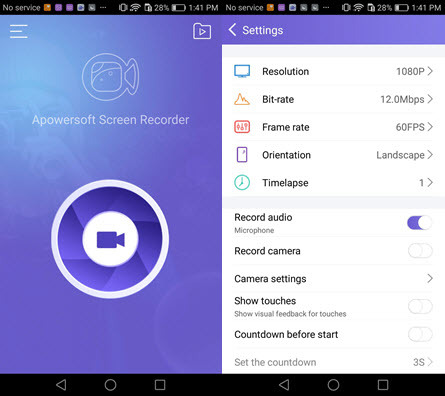 If you are Android enthusiasts, then the best way for you to record Facebook Live is by utilizing a mobile application called Apowersoft Screen Recorder. This application can be downloaded from Google Play Store for free. Unlike other screen recorder for Android, this app does not require any root access for it to work. Just install the app and it will work right away. The features that you can get from using this app include screen recording as well as screen capturing. It also supports front camera recording perfect for making reviews and analysis. Plus, this program has an overlay icon for a more flexible screen recording. In recording live broadcast on Facebook with this program, here are the simple steps. Get and install the screen recorder by downloading it from Google Play Store or just click the button below for an easier access. Once it is installed, open it and go to settings and make some configuration like resolution, bit-rate, frame rate, output folder, etc. 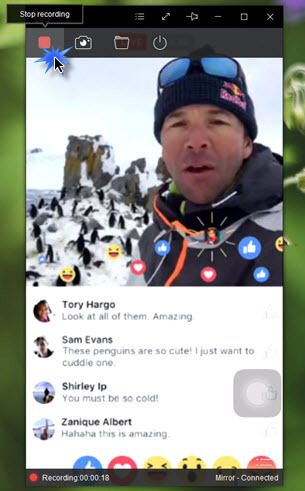 Next, look for Facebook live video streaming and tap it to enlarge. Now, launch back the tool and tap the camcorder’s icon to start recording. To end capturing, just tap the “Stop” icon on the recorder’s interface and the recorded file will be included under the tool’s recording list. Those are the awesome ways on how to record live on Facebook. Just try and choose the one that suits your needs. And in recording live stream videos, internet connection is quite important, so be sure to have a good internet connection to obtain a good video.